A comprehensive reference to renewable energy technologies with a focus on power generation and integration into power systems This book addresses the generation of energy (primarily electrical) through various renewable sources. 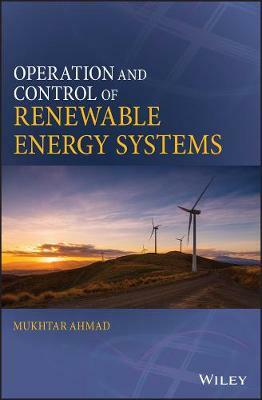 It discusses solar and wind power two major resources that are now in use in small as well as large-scale power production and their requirements for effectively using advanced control techniques.In addition, the book looks at theintegration of renewable energy in the power grid and its ability to work in a micro grid. Operation and Control of Renewable Energy Systems describes the numerous types of renewable energy sources available and the basic principles involving energy conversion, including the theory of fluid mechanics and the laws of thermodynamics. Chapter coverage includes the theory of power electronics and various electric power generators, grid scale energy storage systems, photovoltaic power generation, solar thermal energy conversion technology, horizontal and vertical wind turbines for power generation, and more. * Covers integration into power systems with an emphasis on microgrids * Introduces a wide range of subjects related to renewable energy systems, including energy storage, microgrids, and battery technologies * Includes tutorial materials such as up-to-date references for wind energy, grid connection, and power electronics plus worked examples and solutions Operation and Control of Renewable Energy Systems is the perfect introduction to renewable energy technologies for undergraduate and graduate students and can also be very useful to practicing engineers.